Microsoft has unveiled the latest handset in its burgeoning Lumia range - the Microsoft Lumia 640. 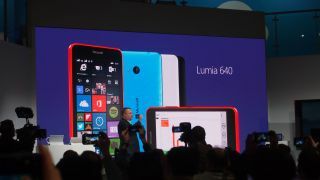 There's been plenty rumours about the handset so there wasn't too much surprise when Stephen Elop took to the stage at MWC 2015 to revealed the Microsoft Lumia 640. The Microsoft Lumia 640 won't come with Windows 10 straight out of the box, but Elop noted that it will be fully upgradeable to the new mobile OS later in the year. Full specs include a 5-inch screen, 1.2Ghz quad core chip inside, 3G & LTE functionality, an 8MP camera, 2500mAh, gorilla glass, Windows 8.1 and it is also NFC enabled. There will also be single and dual sim variants of the device. If five inches is just too small for your pocket, then you will be pleased to read that Microsoft has also released an XL version of the device. Unsurprisingly, the bigger handset has been called the Microsoft Lumia 640 XL and it comes packing a 1080p 5.7inch screen, 13mp camera and LTE. The device will also come with a one-year subscription to Office 365 and the Windows 8.1 OS will be upgradeable to Windows 10 when it is released. You get all this for 189 Euros. Microsoft said that, among others, Carphone Warehouse, T-Mobile, O2 and Orange will be stocking the device in Europe. AT&T in the US will stock the Lumia 640 and 640 XL. If this is all a little too middle of the range for you, then don't panic: Elop insisted that its flagship Lumia will be unveiled later this year.